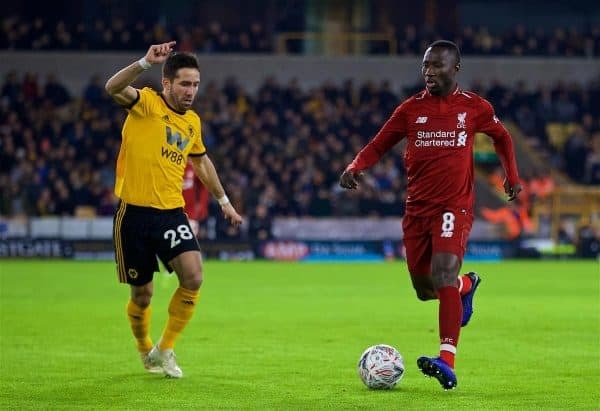 A highly experimental Liverpool side suffered an early FA Cup exit after Ruben Neves’ long-range strike secured a 2-1 victory for Wolves. Starting for just the second time this season, the Belgian did little to inspire confidence despite his status as one of the most experienced figures in the side. Could have done better to make things more difficult for Raul Jimenez with the opening goal, and perhaps a little slow to shift across for Ruben Neves’ admittedly brilliant strike. Unconvincing distribution also put team-mates under unnecessary pressure on numerous occasions. A performance which illustrated the gulf in class between him and Alisson. Making his first ever senior appearance, the Portuguese teenager did reasonably well in the circumstances, showcasing his natural attacking instincts by getting forward and showing for the ball throughout. On a few occasions, his high starting position meant he was caught out, as could be expected given his lack of experience at this level. A respectable showing, but perhaps a little too early to consider him a viable backup for Trent Alexander-Arnold. Hobbled off with a muscular problem after just a few minutes, to be replaced by debutant Ki-Jana Hoever. Jurgen Klopp will be hoping it’s nothing serious, as Lovren’s absence would leave Virgil van Dijk as the only remaining fit senior centre-back for the time being. Tasked with marshalling a vastly inexperienced back four while also playing out of position himself, the Brazilian mostly coped admirably and showcased his strong reading of the game to cut out numerous dangerous situations. Dived in and missed his tackle in the buildup to Wolves’ opener, but he had little option but to commit after James Milner had lost possession. 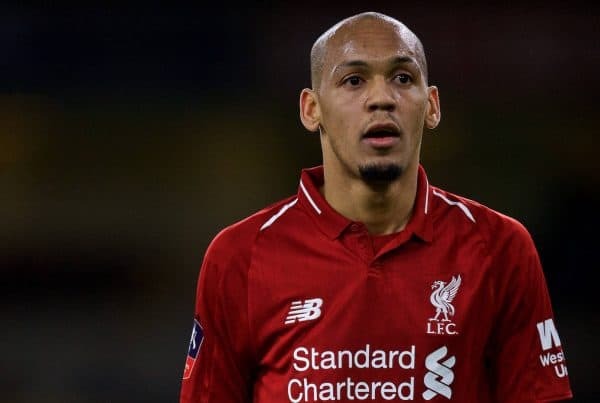 Might be needed to continue as a makeshift centre-back against Brighton should Lovren be unavailable. A rare opportunity for the Spaniard who is into the final six months of his contract at the club, and here it was evident just how much of a gap there is between him and Andy Robertson. His poor ball infield put Milner under pressure as the No. 7 lost the ball in the lead up to Wolves’ opener, while his quality was lacking in an attacking sense, failing to provide an effective outlet down the left. A total inability to use his right foot in any situation was also exposed in several instances. A difficult game to judge Milner on, given he was effectively tasked with playing three or four positions all at once. Dropped deep constantly throughout the first half to stay close to Hoever, while also having to drive the team up the pitch from midfield. By far the most experienced player in the team, but he had too much to do. Lost the ball in a dangerous area which led Wolves’ opening goal, although Moreno’s pass put him in a difficult scenario. This seemed like the ideal opportunity for Keita to get some much needed minutes after his belt after a frustratingly broken-up season so far. After starting fairly brightly, he dropped off badly and began to give the ball away sloppily in poor areas of the pitch. Showed the occasional glimpse of what he is capable of at times going forward, especially in the second half, but his final ball was lacking at the key moments. Needs to offer more. A long-awaited debut for the 17-year-old academy product, Jones impressed heavily during pre-season but has had to be patient to get his first-team opportunity. He didn’t look out of his depth here, with some smart touches and impressive dribbling in a wide-left birth. Faded as the game went on before being replaced for the final 20 minutes, but did his reputation no harm at all. Really struggled to get into the game in the opening exchanges, but gradually began to get on the ball more and orchestrate attacks as it went on. Far from his best showing, but Shaqiri was one of the few Liverpool players who kept trying to make things happen, always playing forward, albeit the lack of movement in front of him hindered his effectiveness. Extremely unfortunate to see his magnificent free-kick crash off the inside of the post in the second half. In a much-changed Liverpool side, Sturridge was the longest-serving player and along with Milner the most senior figure in the side. That said, he was unable to exert any tangible influence on proceedings and didn’t hold the ball up effectively on the few occasions where he was brought into play. Remained peripheral until his substitution on 70 minutes. As with Sturridge, Origi was almost completely invisible throughout the entirety first half, but to his credit, stepped up after the break and drew Liverpool temporarily level with a superbly taken left-footed strike from the edge of the box, powerfully dispatched into the top corner. His work rate also improved and he began to link play more effectively later on. 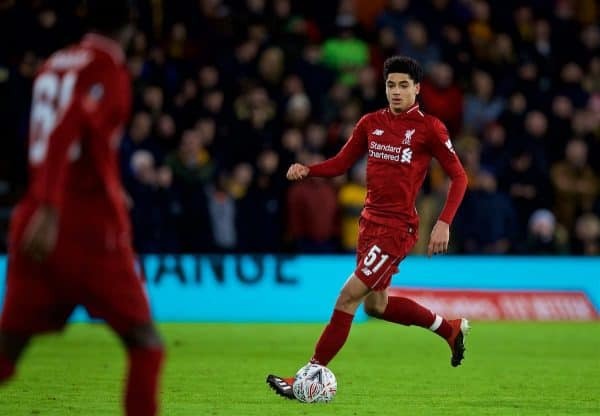 A huge ask for the 16-year-old, who became Liverpool’s youngest-ever player to feature in the FA Cup when he replaced the injured Lovren after just six minutes, slotting in alongside Fabinho at centre-back. A few understandable nerves aside, and the occasional moment where he was a little slow to react, the Dutchman could be very satisfied with his efforts throughout the evening. His reading of the game was impressive, but most encouraging was his bravery on the ball, playing out of defence when the easy option would’ve been to lump it upfield. One excellent recovery and driving run out from the back set up a chance in the second half. A player with bags full of potential, and one we’ll no doubt see plenty more of in seasons to come. Clearly a cut above the rest when he came on along with Salah, Firmino did his best to drag the team back level with several slaloming forward runs. Ultimately, though, he did not have enough time to change his team’s fortunes. 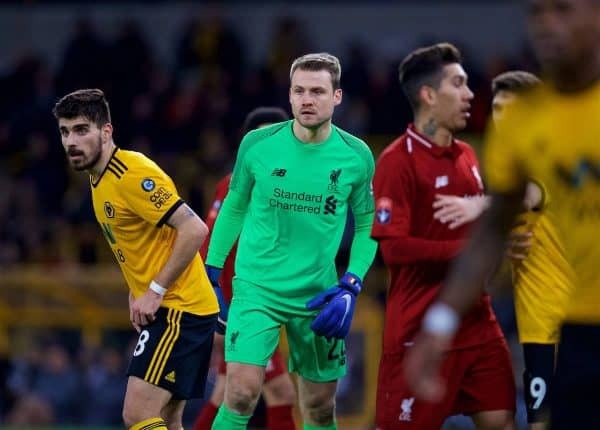 As with Firmino, Salah visibly stepped up Liverpool’s threat level as soon as he entered the pitch, but with Wolves digging deep to see out the final stages, he couldn’t perform a rescue mission this time. 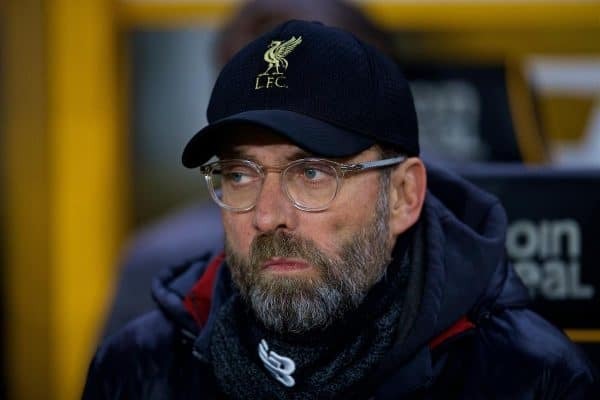 Early FA Cup exits have become a recurrent theme throughout Klopp’s tenure at Liverpool, with the manager regularly opting to use the competition as an opportunity to rest his key men and give fringe and youth players an opportunity. Given the intensity of Liverpool’s remarkably successful December, and the ongoing pressure of leading the way in the Premier League title race, it only made sense to make significant changes here. His plans were not helped by Lovren’s early injury forcing him to throw Hoever into action straight away, and while some will argue his lack of silverware means he can’t be taking this competition so lightly, the defeat should be of little concern in terms of Liverpool’s season as a whole. The focus remains very much on the league and Bayern Munich on the horizon, and a lack of extra games from going out of both domestic cups can only serve as a blessing in terms of focusing on those two main priorities.